Welcome to CoolieCube.com. We take the hassle out of buying coolies and koozies. Simply enter how many coolies you need, and your zip code and we will instantly show you the total price. We'll also show you customized pricing on our TOP 6 selling items too. Pretty coolie, huh? Looking for a simple can koozie that won't hurt your wallet? This cheap can koozie is your go to! We have a variety of colors and can turn in 3-5 business days, see what our cheap can kooizes are all about!. These cheap can koozies don't have the bulk of other coolie products, but instead keep your wallet bulky! Our can coolies are the perfect promotional product for anyone who simply needs to keep their beverage cold. When not in use this customized can kooize can fit directly in your pocket as it is foldable. This kooize is perfect for 12 oz. cans and for those of you looking for a cheap personalized koozie to keep your beer cold. This custom coolie not only comes in a handful of colors but offers over a dozen printed colors. See why this koozie is one of our best sellers! "Coolie Cube makes buying beverage coolies fun." Customized can holders keep your beverage of choice colder and more refreshing longer. This can holder coolie is ideal for promotional campaigns, picnics, weddings, and tailgates. This can coolie is collapsible, folding flat for ease of transportation, whether it is to the beach, a party, or your own backyard. Can coolie is designed to be a can holder for 12 oz. cans and is made with premium 1/8" thick, high-density, open cell foam, offering a more comfortable grip around your drink. 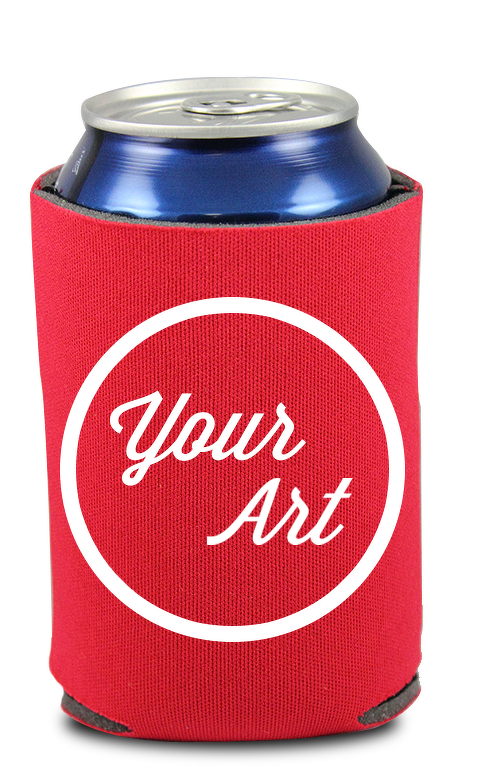 This exclusive full color koozies gives you premium full color graphics that will catch the attention of everyone. 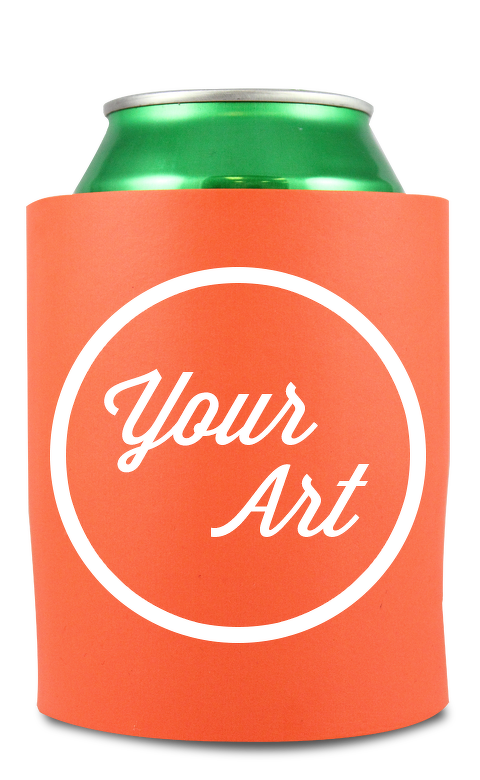 With your own artwork or with the help of our design team to create a flashy color display of your company or organization at your next business event on this can coolie. Your multi-color printed can insulator is collapsible, allowing you to conveniently carry it anywhere you go. 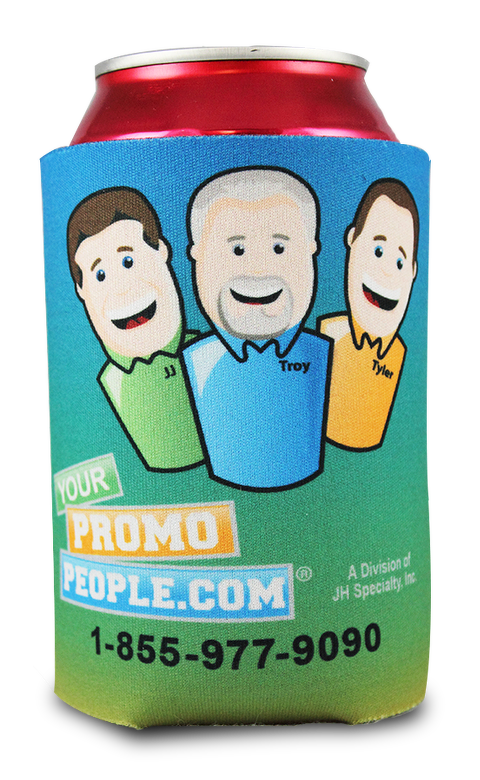 Perfect for a variety of different event…company picnics, organization’s fundraisers, family reunions and marketing trade shows…your custom koozie will become the crowd favorite taking your name to new places. Your can koozie was cut from premium 1/8” thick scuba material to offer better drink insulating power but still maintaining a lightweight feel. It was then tailored to snuggly fit the common size 12 oz. can. Custom foam coolies are the original can coolie and it is still keeping beverages cold today. Great for promotional giveaways and marketing campaigns, in order to get your name brand out to future customers. Equipped with a ribbed interior for easy removal of the can. Designed for 12 oz. cans and made with lightweight, foam material. Perfect for the beach, concerts, and sporting events plus much more. • Zipper bottle koozies are a great way to keep your drink colder and more refreshing up to a longer period of time. The bottle koozie with zipper is perfect for the beach, concerts, and sporting events plus much more. 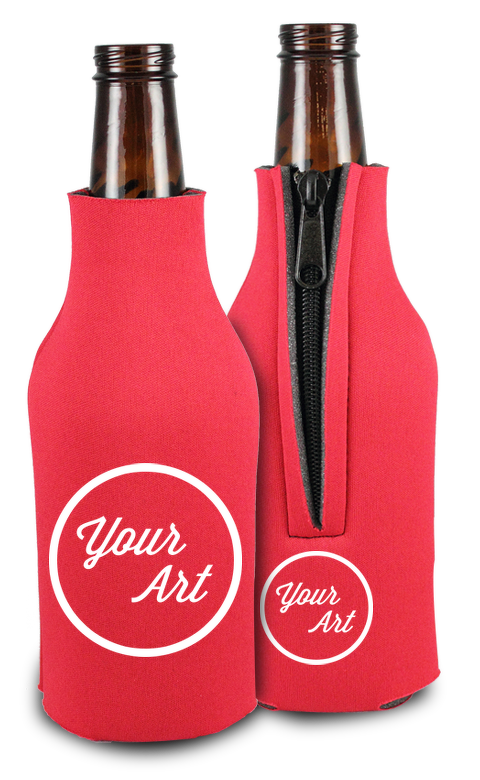 • All bottle koozies can be produced using your artwork or with the creativity of our specialists, guaranteeing a zipper bottle holder you’ll be satisfied with. • Designed for bottled beverages and made with 1/8” thick, high-density, open cell foam. Beer bottle koozie is equipped with a zipper to ensure your coolie receives maximum insulation. 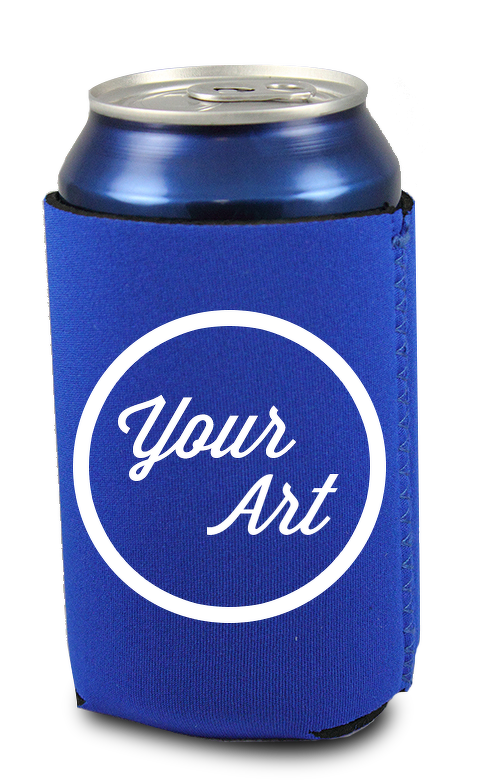 With your creativity, design your own custom neoprene koozie insulator. This neoprene koozie has what you need and is just the thing for personal or business purposes. This neoprene koozie offers a more comfortable hold on your can and keeps drinks colder, longer. 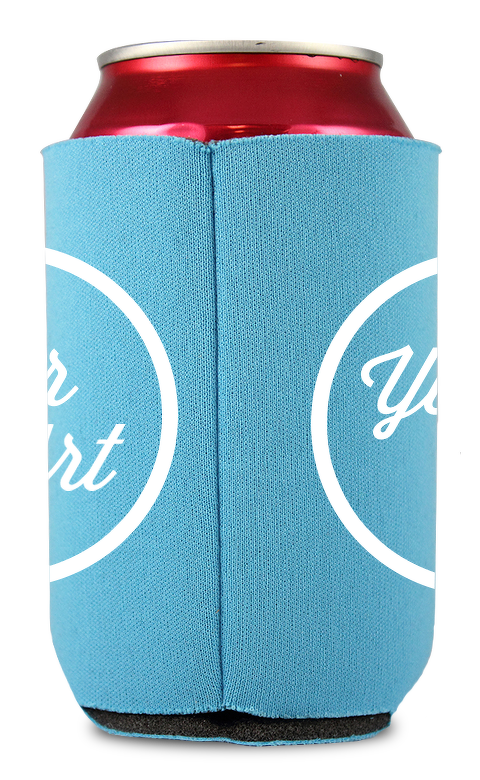 Neoprene koozies are the way to go when looking for a high quality, reliable coolie or koozie. Can holder koozie is designed for 12 oz. cans and made with lightweight, synthetic rubber material, resistant to oils and aging, allowing you to conveniently carry it anywhere you go. We have sold thousands of coolies since 1998. It is too bad we didn't start a counter like a major burger chain did when we started selling coolies. I wonder how far away we are from 1 billion coolies? We continue to grow year over year because we have the best service, competitive pricing, and each order includes free custom artwork by our talented art department. We look forward to earning your business. Give us a call. We answer the phone. No automated attendant. JJ, Troy & Tyler are here to help. For nearly 14 years, the YPP team has been there to help our customers pick the best products for their promotional needs. Contact the Trio if you have any questions or need help fulfilling your order. Coolie Cube is a registered trademark of JH Specialty, Inc. 2012.